BUTLERVILLE, Ind. 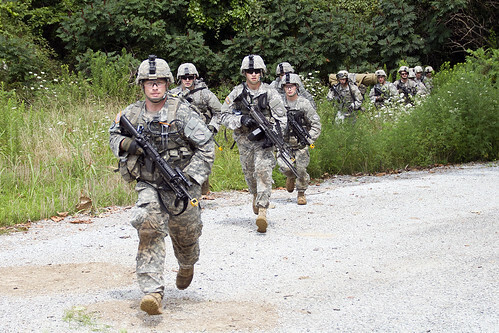 — In terms of basic Soldier skills, the infantry is arguably the hardest training unit in the Kentucky Guard. But it’s not everyday Soldiers of the 1st Battalion, 149th Infantry get to put all that training into a full-spectrum exercise. 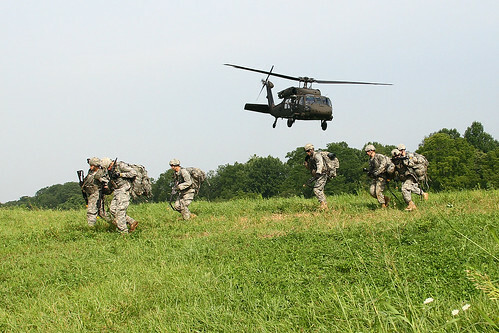 As a culminating event to this year’s two-week annual training for the unit, the Mountain Warriors conducted a multi-day air assault mission at the Muscatatuck Urban Training Center near Butlerville, Ind., July 24-27. Soldiers with Alpha and Bravo Co., 1/149th loaded their gear and flew by UH-60 Blackhawks to the landing zone at Muscatatuck, compliments of the U.S. Army Reserves’ 11th Theater Aviation Command out of Fort Knox, Ky. Each Soldier carried their weapon and everything they needed for the three-day mission on their backs. Many of the Guardsmen flew on their first helicopter ride. And at the end of it, they had to get themselves, their gear and their fellow Soldiers out of the aircraft as quickly and as organized as possible. From the landing zone, the 1/149th was tasked with assaulting and securing a building complex occupied by members of Charlie Company, simulating an opposition forces. The three companies of infantrymen then had to hold their position and establish relations with locals. In advance of the air assault, a small platoon of scouts paved the way for the main body attack. For those scouts, the mission was a couple days longer as they infiltrated the area two days prior to the battalion’s arrival. They were the eyes and ears of the attack. A job they said they wouldn’t trade for any other in the battalion. From boarding and egressing a helicopter, moving as a fire team and even kicking in doors, the Mountain Warriors checked off a number of mission essential tasks they must train for each year. 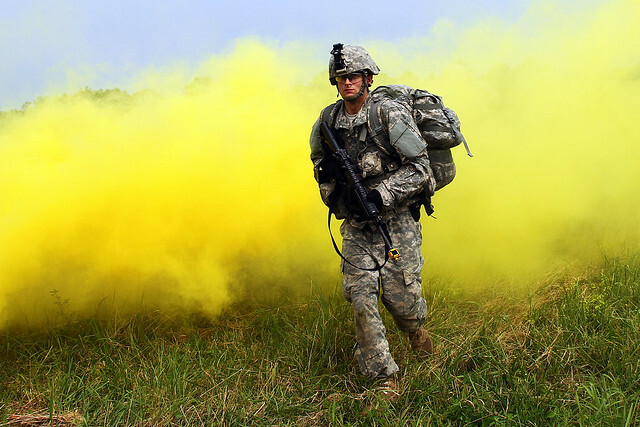 Lt. Col. Joseph Lear, commander of the 1/149th said the AT provided an excellent chance for each section of the battalion to not only train, but to put their job specialities to the test. Members of Delta Company provided the ground assault and convoyed by Humvees to the site. In reserve was the 1149th Forward Support Company, whose job is to ensure the infantry can do their job. Chief Warrant Officer Melissa Propes with the 1149th said the annual training was also an invaluable training opportunity for her Soldiers as well. 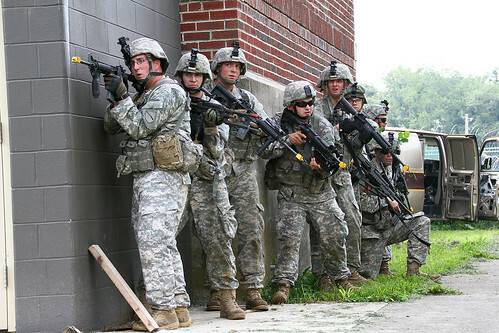 Leading up to the assault mission, Soldiers of the unit trained in a variety of squad and platoon-sized drills at Camp Atterbury, Indiana, to hone their skills and prepare for the final mission. Pvt. Scottie Pace is a cook with the 1149th FSC and attended his first annual training. More than 550 Soldiers of the battalion were on hand for the training period. Platoon leaders and company commanders agreed their Soldiers greatly benefitted from the unique training and the boost in morale. Battalion leadership were pleased with the effort put forth by their Soldiers and the chance to put them in the field and participants and witnesses to the unique energy of the infantry.